Central Crete is known for its major Minoan sites. The Minoans were a Bronze Age people who once dominated southern Europe. The sites portray a high level of civilization. 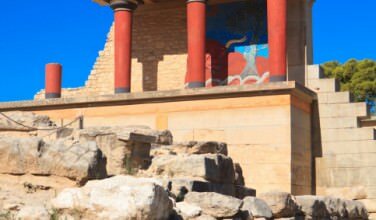 The Palace of Knossos is Crete’s most visited historical tourist attraction and was the capital of Minoan Crete. Its ruins were discovered in 1900 by the British archaeologist Sir Arthur Evans. He spent 35 years excavating and reconstructing it. The reconstruction continues to be controversial because many archaeologists believe that he sacrificed accuracy during the project. Highlights of The Palace of Knossos include the fresco of a charging bull (bulls held a special status in Minoan society) in the North Entrance, the Grand Staircase (four flights of gypsum steps) that provided access to the royal apartments in the eastern wing, the Queen’s Megaron; the queen’s bedroom that features a dolphin fresco and a sophisticated bathroom and drainage system, the Fresco Room with views of the palace grounds from the west wing’s upper floor and copies of the palace’s most famous art works, the Giant Pithoi or massive clay jars that were used to store wine, oil, and grain, the Prince of the Lilies Fresco that depicts a young man adorned in lilies and peacock feathers, and the South Portico; a palace entrance anchored by a massive open staircase decorated with frescoes. Visitors can take guided tours in English that last about 90 minutes. Phaestos is Crete’s second most important Minoan palace city after Knossos. It has a similar layout to Knossos and was also built atop a previously destroyed older palace. The Central Court is well preserved and conveys the magnificence of the palace. Views of the Mesara Plain and Mt. Psiloritis can be seen from Phaestos. 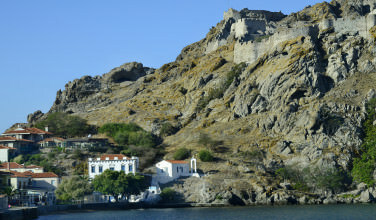 Agia Triada was most likely a small palace or a royal villa. 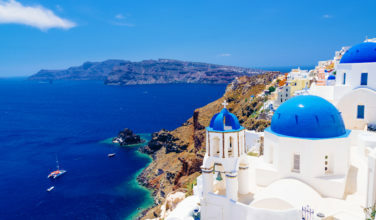 The setting provides mountain and sea views. Many masterpieces of Minoan art can be found here. The Palace of Malia includes a series of storage rooms to eight circular pits believed to have been grain silos. Past the silos is the palace’s Central Court. In the ground is the Kernos Stone, a disc that may have had a religious function. The most important rooms include the Pillar Crypt, the Grand Staircase and the Loggia, most likely used for ceremonial purposes. Buildings north of the central court held workshops and storage rooms.